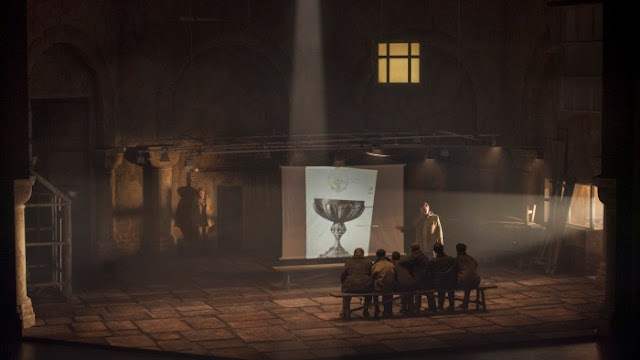 The philosophical ideas behind the libretto of Parsifal are Christianity and Buddhism but the actual trappings of Wolfram von Eschenbach’s 13th-century poem - focusing on the Arthurian hero Parzival and his long quest for the Holy Grail - are, basically, Christian based. Wagner actually described Parsifal - his final and farewell work to the world - as ‘ein Bühnenweihfestspiel’ (A Festival Play for the Consecration of the Stage) not an opera thereby underlying the deeply-religious overtones the work harbours and this fact is more than highlighted at the end of act one when the Grail King, Amfortas, with members of the Brotherhood closely gathered round him, partake of Holy Communion (the Blood of Christ) from the Holy Grail, the cup from which Christ is supposed to have drunk at The Last Supper. 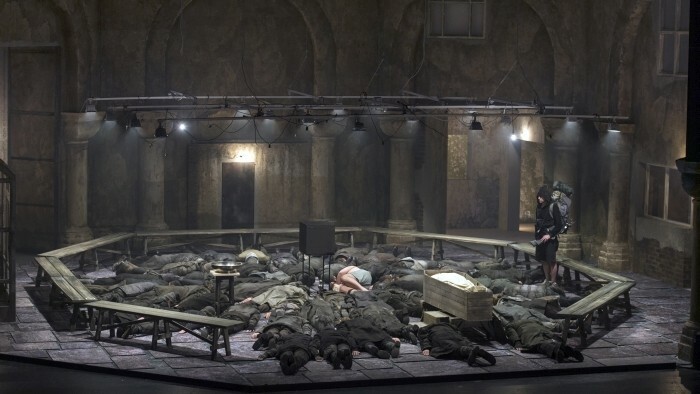 The scene was as powerful as it comes while the Christ-like figure of Amfortas was magnificently and sensitively portrayed by the gifted and talented Estonian baritone, Lauri Vasar, whose voice - clear, precise and articulate - radiated round the large and inviting auditorium of the Schiller Theatre in a smooth fashion. The Grail Knights, casually dressed, were kitted out in heavy-duty clobber going about their day-to-day business but when Gurnemanz, the veteran knight of the Holy Grail, arrives on the scene he stops them in their stride to explain through the aid of a slide-show depicting a rather primitive drawing of the 19th-century set design from the Bayreuth production the trials and tribulations that have befallen him and his fellow knights over the years. 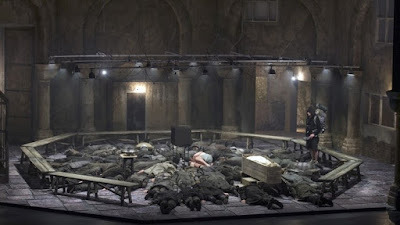 The role of Titurel was admirably sung by Matthias Hölle who harbours a strong deep-bass voice and delivered a confident and rewarding performance that I don’t think could be bettered. The Flower Maidens scene opening act two stirred the emotions and raised an eyebrow or two witnessing the despised, fallen knight and evil sorcerer, Klingsor, greasy-looking, spectacled with heavy-duty rimmed glasses, nervously attending to every minute detail about his dress, image and so forth. He acted in a cool, creepy and over-protective way towards his charges who were nicely turned out in an array of eye-catching, flower-patterned, dresses enjoying themselves skipping, playing with dolls, hula-hoops - that sort of thing. Tomas Tómasson proved a good choice for the beastly role - his strong, dramatic and earthy voice proved totally convincing. The scene when Kundry tempts Parsifal of the sins of the flesh was well executed with two actors re-enacting the attempted seduction when the mother of the boy bursts in unannounced furious of what she stumbles upon. Annoyed and frustrated by the intrusion, her son pushes her fiercely to the ground while Kundry - who suffered endlessly for mocking Christ on the Cross - quietly walks away. When Kundry - penitent and sorrowful - washes the feet of Parsifal it proved a poignant and telling moment as always. And when she’s baptised by Parsifal, Gurnemanz explains to the young hero the spell of Good Friday where Nature is transfigured by love and innocence completely regained. 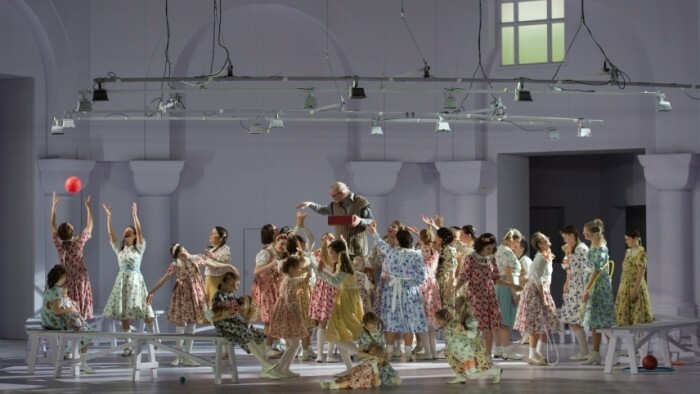 In the final act, the Bayreuth production of 1882 is once more rekindled in a slide-show retelling but the Russian-born director, Dmitri Tcherniakov - who has worked with Daniel Barenboim on several productions at Staatsoper - decided to add an extra twist to the plot in respect of Kundry’s downfall. In his realisation, Kundry (Anna Larsson) meets her end at the hands of Gurnemanz after being redeemed from her sins by Parsifal. So much for his Christian beliefs! But ‘redemption’, of course, is the keyword in Wagner’s operas Overall, the opera was extremely well cast. René Pape delivered a strong and authoritative performance as Gurnemanz while Andreas Schager (Parsifal) played his role to the full in a somewhat naïve and carefree way as a keep-fit fanatic and a backpacker to boot. As far as Wagner operas are concerned the orchestra is just as important as the singers and under the baton of Maestro Barenboim, his charges in the pit more than rose to the occasion. 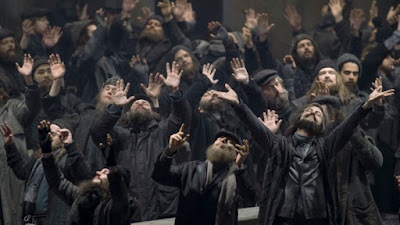 They excelled themselves and were heard to good effect in the Prelude to act one based on motives heard in The Love Feast and The Spear as well as the ‘Dresden Amen’ representing the Holy Grail while the Transformation Music was brilliantly executed. Incidentally, the ‘Dresden Amen’ was composed by Johann Gottlieb Naumann for use at the Royal Chapel, Dresden. But such was its popularity that it took Saxony by storm and used by Catholics and Lutherans alike. Wagner also incorporated the piece in Das Liebesverbot (one of his earliest operas) and, indeed, drew upon it for the third act of Tannhäuser. And let’s not forget the members of the chorus who, under the guidance of the American-born conductor, Martin Wright, put in some hard, diligent and exciting work.